Albert Einstein was a yogi, like the Buddha. What then is really yoga? In the recent years yoga has commercialized into a non-stopable exercise fever across the world. When you ask the average person walking down the street what yoga is, he will probably tell you it is an exercise routine he himself practices twice a week in his work gym. Ask another, she will probably show you on the spot how well she can do the downward dog. I too teach various yoga poses in my morning aikido class as a part of an exercise routine. So is this it? Yoga helps us to slim down? According to wikipedia – “Yoga refers to traditional physical, mental and spiritual disciplines, originating in ancient India, whose goal is the attainment of a state of perfect spiritual insight and tranquility.” Yoga Journal covers yoga poses, yoga lifestyle, health through yoga, yoga wisdom, yoga community, yoga conferences and yoga videos. 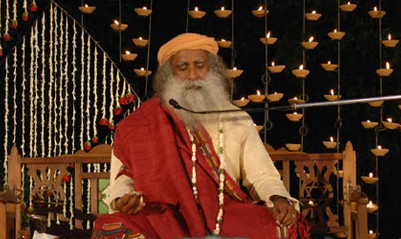 I have personally practiced power yoga, ashtanga yoga, hatha yoga,bikram yoga before stepping into Isha Yoga. Yoga means yoke, to join, or to become a union. In the physical forms of yoga practice, we learn to integrate our mind into the physical posture. Later we learn to draw our breath to become one with the mind and the posture. The goal in yoga is to become one. Beginners can learn to have one mind instead of a conflicting mind. Then move onto using the mind with the body and the breath to become one complete harmonious being. Advanced yogis can take one step further, once we are in harmony within ourselves, we can then experience the oneness with other individuals and nature around us. Lots of different yoga studios around town will offer you the beginning courses into yoga – learning from poses to breathe to calming the mind. However some of us still desire to experience a deepened practice beyond the superficial. We long to experience the oneness spiritual teachers throughout the ages have spoken of, we long to experience being in union with All That Is. This is where Isha Yoga comes in. After my second class BSP, I was finally able to feel complete oneness with everyone and everything. I no longer judged gurus and I felt a sense of affection toward myself, nature and individuals I called strangers. I opened up. All That Is was me, and I am a part of the experience within the universe. I was a fractal microcosm within the macrocosm. I was high in bliss. And that was the first time I completely understood Albert Einstein’s quote “A human being is part of the whole called by us universe, a part limited in time and space… Our task must be to free ourselves from the prison by widening our circle of compassion to embrace all living creatures and the whole of nature in its beauty.” And I felt the Truth in his words as tears of appreciation streamed down my face when I gazed upon Sadhguru. Today as I share my Isha Yoga experience with you, I hope you will find within yourself the curiosity to explore – to explore a deepened yoga experience, to explore a beautiful life, and to explore your peak potential. This is so beautifully expressed. I am grateful to know you. I see you. You are truly an inspiration. Thank you so much Sailesh for your introduction to Isha Yoga. I just finished Hata Yoga in LA – what an amazing experience! Now knowing what I know about what yoga is and how good my body feels I will never go back to the “street yoga”. Beautiful piece! Had tears in my eyes (and after Isha, I am not ashamed of my tears anymore)! !